Rondon’s chance of winning a seat appeared bleak on election night. His chances improved after the mail-in votes were counted on Friday. He was behind Arrington by less than 60 votes. His running mate, Eddy Olivares, who was also behind on election night, managed to take a lead over Eddy Pichardo. Rondon and Olivares won the two one-year unexpired term seats. Both men ran as a slate in the 7-person truncated-term race. “I’m shocked. I’m disappointed,” said Arrington on Monday. He conceded defeat and congratulated his opponents. Arrington received a call from school board president Oshin Castillo breaking the bad news while driving to the district headquarters for a Thanksgiving game planning meeting. “I was like let’s turn around and go home, say forget it, or do I come serve the students of Paterson. I came here for the meeting,” he said. School board members appointed Arrington in January to replace Christopher Irving, who had been tapped by governor Phil Murphy’s administration to serve as Passaic County superintendent of schools. Irving left the post to become superintendent of the Teaneck school district. “I’m still going to do work for the City of Paterson, for the kids. I’ll regroup and come back next year,” said Arrington. 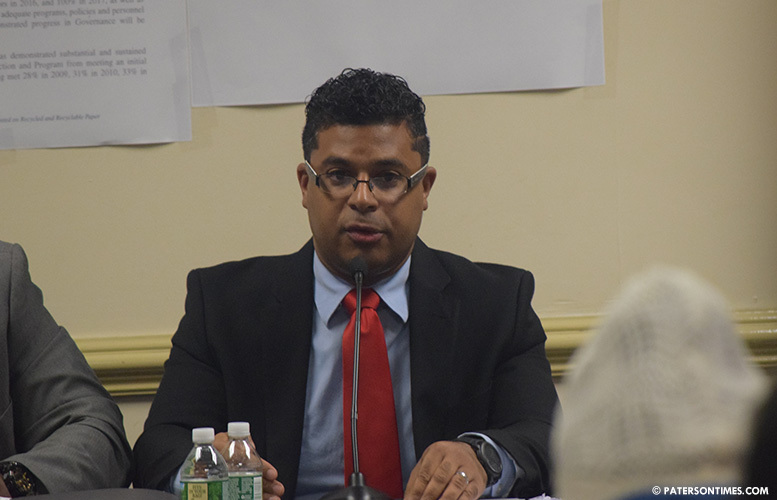 Rondon (pictured) thanked former councilman Alex Mendez and former school board member Pedro Rodriguez for their backing. He also thanked his running mates and others who helped him win the seat. Mendez and Rodriguez, bitter foes in the mayoral race in May, joined forces to back four candidates to unseat the incumbents. Their other two candidates, Eduardo Lanchipa and Ramon Joaquin, who ran in the 10-person full-term race, fell short. Incumbents Oshin Castillo, Nakima Redmon, and Manny Martinez, backed by two super PACs and prominent politicians, kept the challengers at bay. Assemblyman Benjie Wimberly, mayor Andre Sayegh, councilman Luis Velez, and councilwoman Ruby Cotton endorsed the incumbent slate. The incumbent slate included Pichardo and Arrington. Passaic County election officials have put out unofficial election tallies inclusive of mail-in votes on Friday. The county has yet to put out a tally that includes provisional ballot count.